“Why do the bubbles rise like that?” Daniel asks as he watches his mother stir a boiling pot of noodles. As she explains how water turns into steam, he grates cheese and measures it into a bowl on the counter. Together, Daniel and his mother planned this meal of spaghetti, turkey meatballs and salad. He has already mastered muffins and mashed potatoes. Tonight, with a little help from his grown-up assistant, he is making a meal. Daniel has spent the last half-hour measuring spices, washing lettuce, reading labels, and stirring the tomato sauce. Dinner may have taken a few extra minutes to get on the table, but Daniel, a second grader, is learning a skill many adults haven’t mastered: how to cook a healthy meal. Certainly, it’s easier and faster to do it yourself. 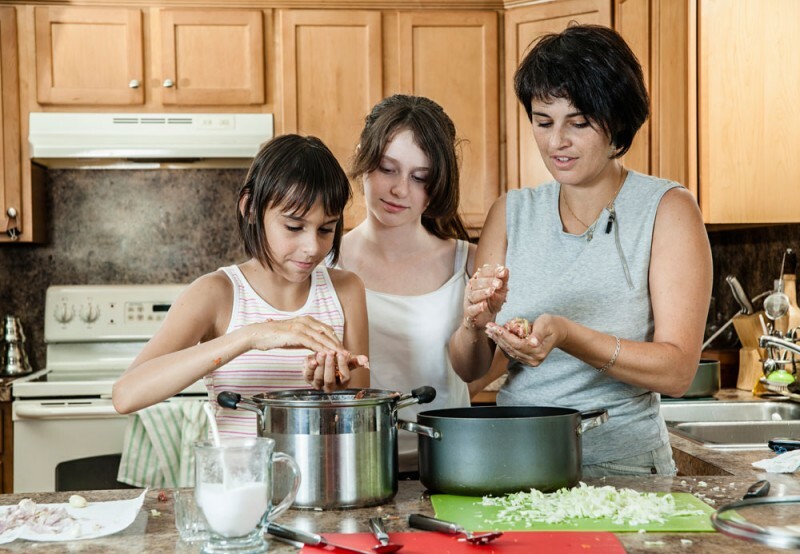 So why encourage your school-age child to join you in the kitchen? Because the lessons they learned there can be a benefit at home and in the classroom. Grandma’s secret zucchini bread recipe can be your chance to pass on a little bit of family lore. Did you love peanut butter and banana sandwiches when you were 7? Tell your child about the kind of foods you liked as a kid. The kitchen is also a place to ask thought-provoking questions like: To make a really colorful dinner, which foods would you include? As kids learn to crack eggs and stir sauce, they also gain new science, language and math skills. Basic math skills (“are we putting in more salt or baking soda?”) and sequencing skills (“what is first … next … last?”) give way to fractions (“is this \0xBE of a cup?”) as your child gains confidence in the kitchen. Reading recipes can improve reading comprehension, and something as simple as salt sprinkled on an ice cube demonstrates basic science principles. © 2016. Article adapted from The Nemours Foundation/KidsHealth®. Used under license.